The CPSX Graduate Students’ Council provides a means of bidirectional communication between participating graduate students and the CPSX Executive Council. The student's council is comprised of a senior leadership team consisting of a President, Vice-President, Treasurer, and Secretary, each of whom serves for a one-year term. Each CPSX-linked department is represented by a member of the council for a period of one year. The council actively seeks to create a sense of community amongst students emanating from a variety of departments across campus by organizing various social gatherings enabling graduate students from the different departments to meet in a non-academic setting. Biography: Matthew Svensson is a Ph.D. student with the Department of Earth Sciences and the Centre for Planetary Science and Exploration. His research includes topics in impact cratering, clay mineralogy, light stable isotope geochemistry and analogues for planetary exploration with a focus on how some impact craters could provide suitable habitats for early forms of life. 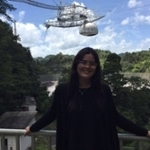 Biography: Carolina Rodriguez is a MSc student with the Department of Earth Sciences and the Centre for Planetary Science and Exploration under the supervision of Dr. Catherine Neish. Her research includes topics in planetary radar remote sensing, Mars volcanism, and analogues for planetary exploration. Biography: Chimira Andres is a M.Sc. student with the Department of Earth Sciences and the Centre for Planetary Science and Exploration. Her research focuses on the topics of planetary and periglacial geology, glacial sedimentology, and landsystem analyses, mapping, and modelling with implications to Earth-Mars analogs. Biography: She studies carbonaceous molecules and dust, particularly Polycyclic Aromatic Hydrocarbons in the interstellar medium using infrared spectroscopy.